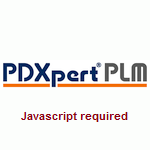 Each part in PDXpert PLM software has a Source list, which is a ranked set of approved manufacturer parts. This application note suggests which sources should be included by the design team, and why original equipment manufacturers' parts are preferred over distributors' part numbers. Industrial, commercial and consumer products often combine internally-designed and externally-sourced components. Screws, resistors, paint, and other off-the-shelf items may be acquired from any producer that fulfills the requirement. Every purchased part in your warehouse has at least one, and preferably several, approved original equipment manufacturer ("OEM") sources. Multiple OEM parts are interchangeable with each other when their relevant functional and physical properties are equivalent. Part interchangeability — that is: form, fit, and function equivalence — ensures that any approved source can be used for the application. Who creates & conforms to the specification? One of product designers' principal tasks is identifying which items may be sourced from outside the company, and then qualifying those sources to ensure that they comply with the defined requirements. Functional and performance specifications are defined by the part's OEM. If the part meets requirements, it's the result of the original OEM's engineering and production processes. If the part fails to meet the published specification, only the OEM can address the problem. Of course, a local distributor often facilitates communications between customer and OEM. But the distributor can't be more than a facilitator: if you have a problem with the part meeting the published spec, the distributor may give you a refund but certainly won't review the original design documents, verify the production process, or write a corrective action. Engineering has qualified the OEM's part using the manufacturer's technical data, and therefore must identify this item using the OEM's name and part number. If the OEM's part has been qualified using the manufacturer's technical data, does this mean that the OEM's distributor will always provide that exact item? Or is it possible that the distributor could provide an "equivalent" item? When a designer specifies a distributor's part number, the implication is that this part (organization + number) has been qualified. For very complex parts, the distributor will invariably fulfill the order using the OEM's exact part: no distributor will treat AMD and Intel processors as equivalent and interchangeable under the same part number. On the other hand, simpler parts (screws and other hardware, perhaps ribbon cable or even resistors) may be deemed equivalent between OEMs. If a distributor switches alliances, and you refer to the distributor's number, then it's the distributor's judgment whether they can substitute one source for another. After all, you're ordering the distributor part number, not the manufacturer's number. If a distributor's part has been separately qualified using the distributor's own specifications, then buyers can rely upon the distributor's part number. However, a distributor part number may not be a reliable indicator of the part's specifications, and the distributor part number shouldn't be listed as a qualified source. Although the PLM system must accurately and completely reflect all necessary requirements, we want to provide as much flexibility as possible. Equally important, we'd like to avoid insignificant changes to the product definition, such as adding a new distributor of a previously-qualified part. In general, Engineering qualifies responsible manufacturers and their assigned part number / datasheet. Engineering decides how the part performs, but not how the part is obtained. Purchasing must choose the best way to obtain the qualified part, and this choice is affected by the dynamics of business relationships, contracts, schedules, packaging options, shipping rates, payment terms and (especially) prices. If a new distributor can offer better terms, or quicker delivery, then the decision is within the scope of production rather than design, and no engineering participation is expected. While it's usually better to avoid formalizing supply chain details within the product definition, designers often have useful knowledge about where parts can be acquired. To communicate this knowledge, designers can add supply chain recommendations to assist their purchasing colleagues. If identifying source recommendations would be helpful, then there are several alternatives. Add the distributor's name into a custom attribute field based on the Organizations collection, and the part number based on a text custom attribute. You can choose how many distributor name/number pairs to maintain (perhaps Distributor1 / DistNumber1; Distributor2 / DistNumber2; ...). Since custom attributes are item-level properties, updates won't require a change form. Use the OEM part's general-purpose Notes field to add an arbitrary number of distributors with their part numbers. The principal advantage of tying the distributor to the OEM part, rather than the home part, is that adding or removing a manufacturer's part automatically adds or removes references to the related distributors' parts. However, if you need to track distributors under revision control, or the distributors must be included in PDXpert's standard BOM with Sources report, then use the source's rank to distinguish your truly qualified OEM part(s) from indirectly qualified distributor part(s). For example, you may want to establish a rule that all indirectly-qualified sources are assigned ranks higher than, say, 20. If you include recommendations on your Sources list, any updates would require processing a change form. Although a recommended distributor may appear as a source, it must be understood that the first-ranked OEM parts actually fulfill engineering's requirements. The buyer remains responsible for ensuring that the recommended distributor part is, in fact, the qualified manufacturer part, and that the distributor is not providing a non-qualified substitute. A distributor may provide a value-added service such as preparing cable assemblies, programming flash memory or trimming a part parameter to a specific value. These modified parts aren't considered the original manufacturer parts, and would be assigned unique distributor part numbers that represent the original part source as modified by the process applied by the distributor. For internally-developed design parts that are sent to a contract manufacturer (CM), there's a useful shortcut. Usually Engineering qualifies a CM for some set or style of parts, and Purchasing purchases from the CM using the Engineering-assigned internal part number. 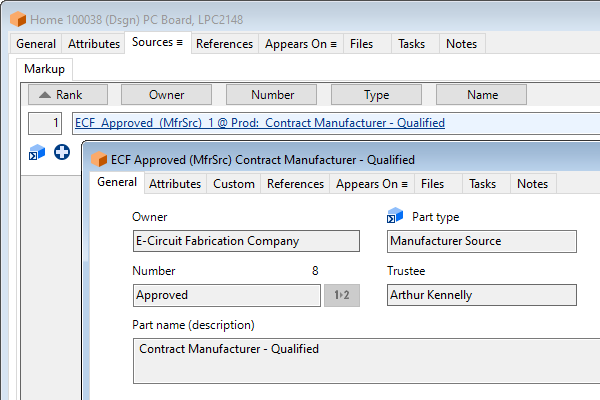 In this case, you don't need to create a separate manufacturer source record for each of your CM parts. You can simply create a single record with that CM as owner and a part number such as Approved. Apply this record as the source for all parts that the CM is qualified to provide. This avoids having to create a duplicate partner record for each home designed part. Each home part displays which CMs can produce it. The CM's Approved record's AppearsOn:Source list shows what parts each CM is qualified to produce.